This page will become a comprehensive reference page for LinuxCNC's O word. The O word was devised by Ken Lerman as a way to implement several branching routines into the LinuxCNC interpreter. By using the O word a gcode programmer can build subroutines, loops, and conditionals while taking advantage of the interpreter's use of variables and computation. 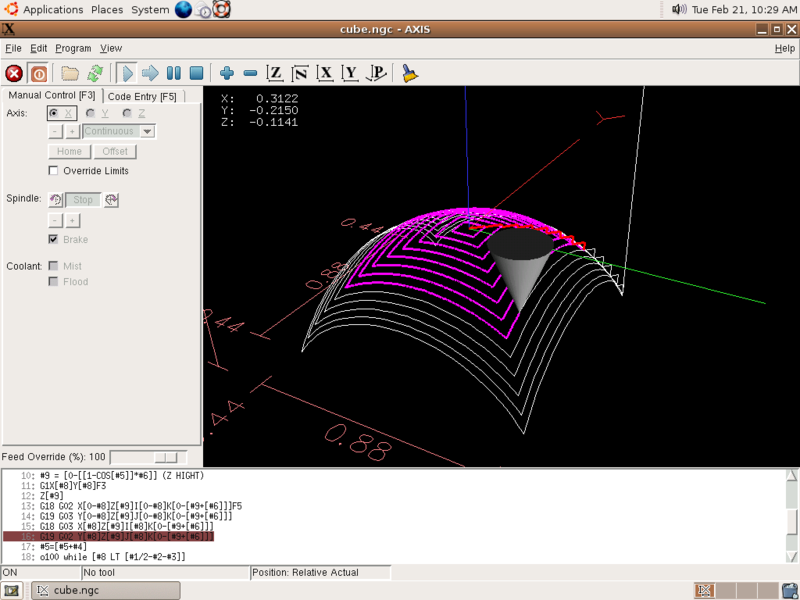 The canonical documentation for O-words is in the LinuxCNC documentation: http://linuxcnc.org/docs/html/gcode/o-code.html. As clarifications and documentation improvements made on this page are incorporated in the official documentation, they should be removed from this page. Each of these control blocks begins with an Onnnnn word. That makes easier for the parser to know what it is doing and isn't a problem for the user. I have to admit, though, that writing "callsub Onnnnn" seems more natural than writing "Onnnnn callsub". Subroutine declarations may NOT be nested. Subroutines may be called anywhere (but must be declared before they are called. They may be called from other subroutines, and may be called recursively if it makes sense. while and if may be nested. They may not overlap without nesting. When the interpreter scans a sub block, it remembers the location of the next line in the file and associates it with the "O" number. It continues scanning, skipping lines until it sees the matching Onnnnn endsub. When the interpreter scans a callsub, it pushes (saves) the current location in the input file (on a stack). It then goes to the location in the file associated with the Onnnnn and starts interpretation there. When the interpreter scans a return, it pops the stack and continues interpretation where it left off. When it interprets an endsub, it treats it like a return. When the interpreter scans a while, it remembers the location of the Onnnnn. If the expression is true (values close to zero are treated as zero), it continues execution. If the expression was not true, it skips execution of all of the blocks until it finds the matching Onnnnn. When the interpreter scans an endwhile, it restarts interpretation at the location of the remembered Onnnnn. (Assumng it wasn't skipping. If it was skipping, it ignores the endwhile). "if" is treated exactly as "while". The matching endif is ignored if the interpreter was skipping. Interpretation is turned back on (skipping is ended). These sample programs are offered without any warranty as to their suitability for any task whatsoever! Use these or model your program after these at your own risk. Code originally by jepler, converted to gcode by KennethLerman (lerman), fixed by jepler. This code will machine an approximation to a ellipse. 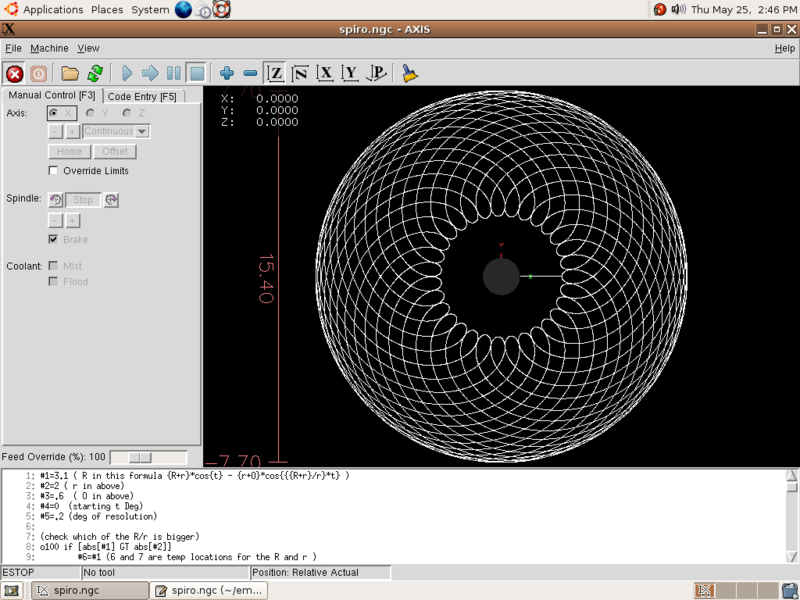 I did this on a whim just to see if it could be done with the current math and loop abilities of LinuxCNC. Here is example output of the below program. [spiro]. It creates pretty big files - again not sure if everything is correct. Use at your own risk :). 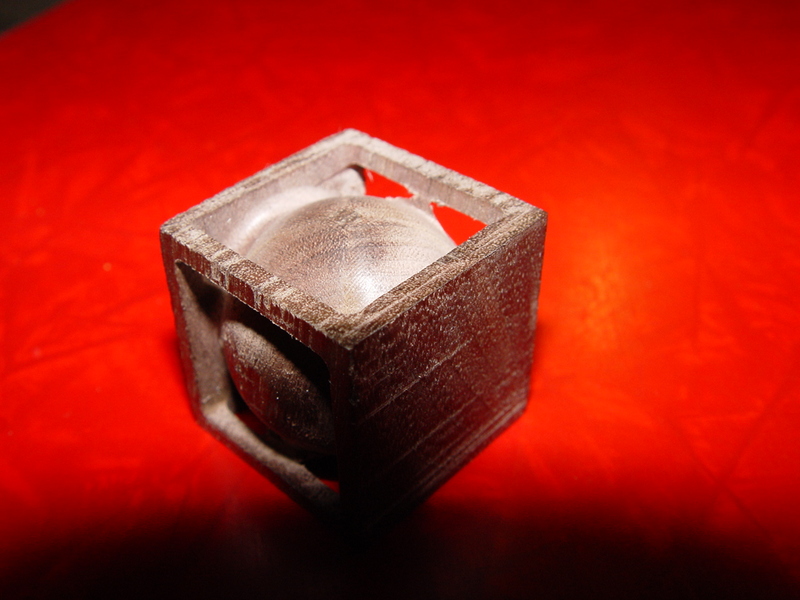 I asked in the LinuxCNC mailing list in 12/2008 how Gcode could create multiple copies of of an identical part. To make the request easy, I asked to cut out a series of squares. Many thanks to Jeff Epler for his response. The following code uses global and local coordinate systems in addition to the Oword calls. As with all new code, test this by cutting air first! 16 April 2014: ring teeth need a bottom roundover, but I may not get to it for awhile 30 Nov 2014: added ring roundover and facility to shorten ring teeth from the "bottom"